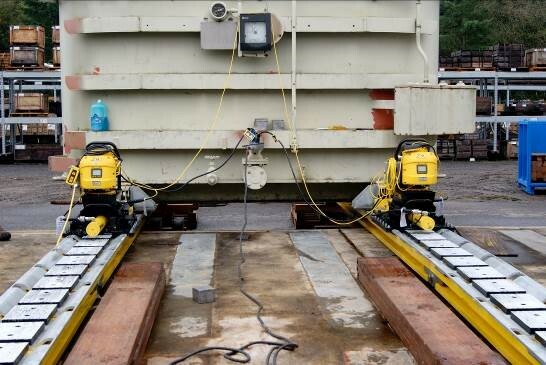 Enerpac’s new Low-Heigh t Skidding System is ideal for transformer maintenance. Global hydraulics and heavy lifting technology specialists Enerpac are introducing to Australasia a new Low-Height Skidding System – which stands at just 92mm with the track – for the accurate positioning of heavy loads in tight and awkward spaces. The Enerpac LH-Series Low-Height Skidding System is a modular track system that can jack and slide heavy loads, such as transformers, generators, motors or drives, over a pre-constructed track. Skidding systems are ideally suited to tight spaces where cranes can’t access the load effectively. The new low-height system takes this one step further by using a rigid, durable design that can access even tighter spaces, while still providing high lifting capacities. Skidding systems are typically 200-600mm high, which is still an enormous advantage when cranes can’t access a lift site, but the Low-Height system, at just 92mm, opens possibilities in even tighter, more compact applications. When using two skidding units together, the maximum capacity is 3,560 kN of force, which can lift 400 tons, utilising 700 bar (10,000 PSI) hydraulic pressure. The Low-Height Skidding System has a push-pull stroke of 600 mm and is designed to easily change skidding direction, using Enerpac’s globally proven hydraulic pumps and cylinders. Customised solutions can be implemented for complex projects, such as utilising optional track support and connecting both power units together to provide synchronous travel of the load. Such a configuration would be used in applications like transformer outage maintenance. In addition to its low height, this system offers a 2-in-1 design. It can be used either on a fully supported surface or combined with the optional track support for added rigidity when the support surface is not fully supported or when spanning a gap is necessary. This two-part design means operators do not need to own two sets of tracks for various ground support conditions. Enerpac is providing world-class support and product training with the introduction of the Low-Height Skidding System, as part of its global “Goal Zero” initiative, which aims to achieve zero harm to its employees, customers and end-users of its products.